The most comprehensive retrospective to date of the work of internationally acclaimed Japanese artist Takashi Murakami includes more than ninety works in various media that span the artist’s entire career, installed in more than 18,500 square feet of gallery space. Born in Tokyo in 1962, Murakami is one of the most influential and acclaimed artists to have emerged from Asia in the late twentieth century, creating a wide-ranging body of work that consciously bridges fine art, design, animation, fashion, and popular culture. He received a Ph.D. from the prestigious Tokyo National University of Fine Arts and Music, where he was trained in the school of traditional Japanese painting known as Nihonga, a nineteenth-century mixture of Western and Eastern styles. However, the prevailing popularity of anime (animation) and manga (comic books) directed his interest toward the art of animation because, as he has said, “it was more representative of modern day Japanese life.” American popular culture in the form of animation, comics, and fashion are among the influences on his work, which includes painting, sculpture, installation, and animation, as well as a wide range of collectibles, multiples, and commercial products. The exhibition © MURAKAMI explores the self-reflexive nature of Murakami’s oeuvre by focusing on earlier work produced between 1992 and 2000 in which the artist attempts to explore his own reality through an investigation of branding and identity, as well as through self-portraiture created since 2000. Two works examining these subjects were a part of a group show, My Reality: Contemporary Art and the Culture of Japanese Animation, presented at the Brooklyn Museum in 2001. Among the works included in this large-scale survey tracing the trajectory of Murakami’s artistic development are many of his acclaimed sculpture figures including the 23-foot-high Tongari-kun (2003–4); Miss Ko2 (1997), a long-legged waitress who has become one of the artist’s signature characters; and Hiropon (1997), a Japanese girl jumping a rope created by milk spurting from her gargantuan breasts. Among the paintings on view will be Tan Tan Bo (2001), as well as Tan Tan Bo Puking—a.k.a. Gero Tan (2002). Tickets for © MURAKAMI are $10 for adults, $8 for older adults and students with valid ID; children under 12 are free. © MURAKAMI tickets include the cost of general admission and are available at the Brooklyn Museum Visitor Center for the day of purchase. 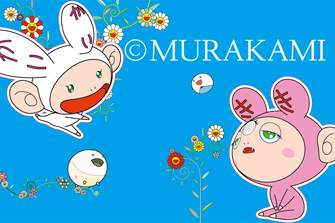 © MURAKAMI is organized by The Museum of Contemporary Art, Los Angeles. The Brooklyn presentation is made possible by DLA Piper with additional support from the Barbara and Richard Debs Exhibition Fund, the Arline and Norman M. Feinberg Exhibition Fund, and the Martha A. and Robert S. Rubin Exhibition Fund. The Los Angeles presentation was made possible by endowment support from the Sydney Irmas Exhibition Endowment. The exhibition and publication are made possible by generous support from Maria and Bill Bell. Major support is provided by Blum & Poe, Los Angeles. Generous additional support is provided by Steven and Alexandra Cohen; Kathi and Gary Cypres; Gagosian Gallery; Galerie Emmanuel Perrotin, Paris and Miami; The Norton Family Foundation; Dallas Price-Van Breda; Janet and Tom Unterman; Ruth and Jacob Bloom; Marianne Boesky; David Teiger; The MOCA Contemporaries; The Japan Foundation; and the E. Rhodes and Leona B. Carpenter Foundation. Art handlers and registrars load in and assemble Takashi Murakami’s Tongari-kun (Mr. Pointy) in the Brooklyn Museum’s Rubin Pavilion.